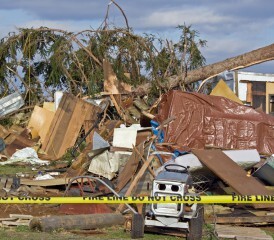 On August 28th of this year, Hurricane Irene hit Vermont and left the Weston Mobile Home Park in Berlin devastated. The 83-lot park got some of the worst damage, 70 mobile homes were destroyed or damaged, and 20 have to be removed altogether. So far of the 20 to be removed, 5 have been found to contain asbestos in the flooring. This will significantly complicate matters and raise the cost of removal. It has been quoted that it will increase the cost of removal by $60,000 for the asbestos abatement in the homes that have already shown they contain damaged asbestos, and require an additional $40,000 to test the remaining mobile homes that need to be disposed of. As many of you may know, asbestos is a naturally occurring fibrous material and is usually mixed with other materials to actually form products, like floor tiles, roofing shingles, and insulation. When left intact and undisturbed, asbestos containing materials do not pose a health risk to the people living and working in the buildings. Asbestos becomes dangerous when it is damaged or becomes friable, meaning that the asbestos is easily crumbled, releasing fibers into the air. Sprayed on asbestos insulation is also highly friable. Floor tile, usually is not. Being torn apart by a hurricane though, changes things. Thankfully for the residents of Weston Mobile Home Park, state officials are fundraising so that the residents don’t have to pay out of pocket. They have raised $150,000 so far but an additional $150,000 will be needed to take care of the asbestos abatement along with the repair and removal of the other homes. This is quite an expensive process as you can see, proper asbestos abatement does not come inexpensively. Were you impacted by Hurricane Irene or other natural disaster? Do you have any words of encouragement? Let us know in the comments.